The era of modernization has hit weddings and the essence of culinary skills is too changing with the changing tastes of globalization and consumerism. Gone are the days when people used to be satiated with the old-fashioned arrangements and dry gatherings at nuptials. The new era demands events, decorations, cocktails and food at its best that too mixture of continental, Asian, Thai and Chinese. 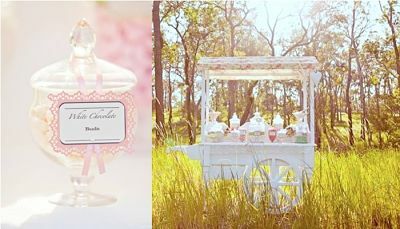 Such is the case of Candy carts and LED Love letters that are a base for any wedding in today’s world. Such is the chaotic competition in weddings that event management has crawled up like a multimillion euro industry. The arrangement of lights to the decorations of imported flowers ,from the Candy carts stalled up in the stands to the beautiful lighting LED Love Letters that mark the essence of love in weddings all form a part of the vibrant wedding culture. The candy carts has been quite famous in western weddings and is emerging like a big business where young children and old grandma are attracted more owing to their love for the candies and nowadays the blending of different flavours like chocolate, vanilla and mixed fruit with creams help to give it a grand spectacle at the wedding. The young ladies too get fascinated by the carts of coloured candies with the sweet corn syrup sugar in its veins giving your palate a watery touch. This is the culture along with the LED love letters that are adding to the aroma of parties and adding and extravagant bonanza to the scintillating nature of parties. 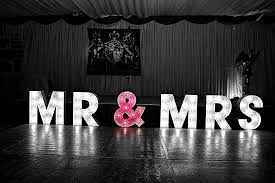 The LED letters flash the sparkling names of the couple in red and help to communicate the felling of unison and they add glamour to the parties. The candy carts come in different themes from vintage to modern, from sugar to chocolaty licky and are gaining more attention than the cocktails. The candies are colourful making even the diabetic to have a glance upon those swirling round candies. 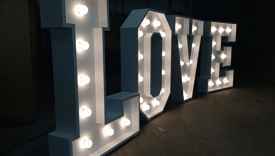 The LED Love letters are more in use as they are energy efficient, control the temperature of the stands and give a balmy touch to the wedding area communicating the feeling of Love in the party and that love alone thrives. The crimson red Love LED letters with heart shaped letters are too in vibrant usage these days. Check out the LED Love Letters over at twilight.